A customer and friend of mine gave me a commission to do five 9″ X 10″ paintings, of her father who passed away. I was honored to do this for her. 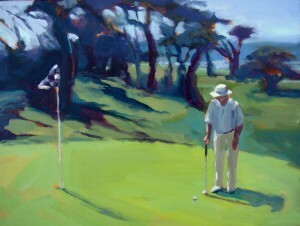 Her father loved golf and she had found a small photo of her father putting, I believe at his favorite golf course, Cypress point. She was worried that I wouldn’t be able to paint her father with five “different” images, and was leaving it to me to experiment and create something unique for each one. Here is the original photo of her father. It was important to capture her father and I asked her what were some of the characteristics that identified her Dad. 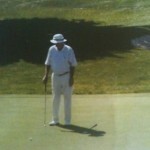 She said he loved to wear that specific hat, he liked light colored clothing; he always wore his watch and wore Khakis. Taking all this into consideration, I decided to use my iPad to expand further on the idea. I have loved how creative the iPad has been for me and allowed me quite a variety of tools to create. 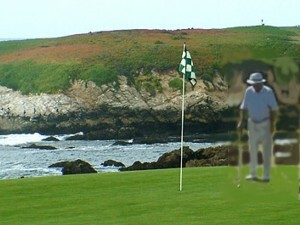 I knew her father loved Cypress Point Golf Course and decided to incorporate the photo on his favorite holes. The iPad allowed me to download the photo of the Cypress hole, crop scenes, expand or edit. I had to take into consideration the different lighting, scale and shadows to correlate with the scene. Here is an example of me laying the photo in the picture. Here is one more example. I placed her father on a hole by the water . Below is the image laid into the scene. And here is the finished painting using the photo for reference. 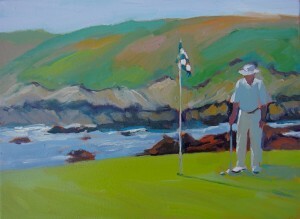 It was important that the lighting was correct and that the figure was in proper scale to the flag. The iPad was such a great tool to use and my customer was estatic and happy she could bring her father to life in these settings. I love doing commissions and hope you will contact me with your future needs. You have so captured the essence of the photograph, your client must be extremely happy to have such beautiful memories of her father. Thanks Christine, it was a honor to capture her father and I really appreciate my friend giving me the freedom to create. Thank you for your comment. Thank you so much for visiting my blog and making a comment. I really enjoyed doing these paintings for her. I love the final product, but also thanks too for sharing the process how how you created the composition. Thanks for sharing. My pleasure, I have found the iPad can help you create in many ways that you can discover on your own. Love the painting, Janet, and the way you showed the process you went through with your IPad. Hi Cheryl, thanks for visiting. It’s amazing how many ideas I get from using the iPad. Thank you so much! How neat is that? I learn something every day. Had no idea that the iPad could be used in that manner. You get high marks for creativity in my book. You know James, I do believe that the iPad allows endless creativity. The trick is to play with it; it’s a great toy. 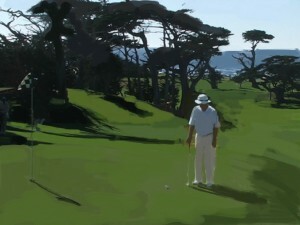 I bet you enjoyed the Cypress Point scenes. I really appreciate you visiting. Thank you! Charming paintings! I think it’s interesting to see how technology plays a role in creating art.